On to Mürren then, a small mountain village at a height of 1634m and with a population of less than five hundred. 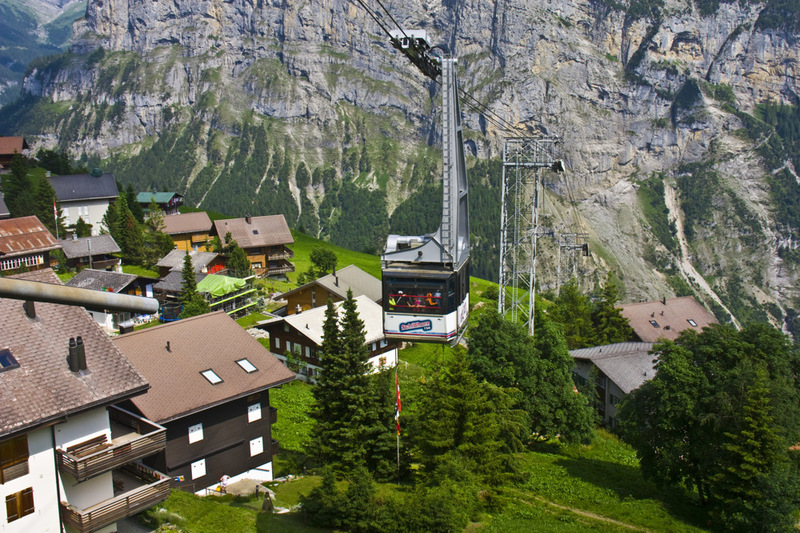 This shot shows the ropeway system Stechelberg-Mürren-Schilthorn. Amazing views from there, I was mostly just viewing rather than attempting to capture everything in my camera. Awesome landscape Ayush! The height is spectacular and I am sure the rest of the view must have been stunning. I think that 'scape qualifies as "rugged", Ayush. Wonderful place Ayush! And I'm glad to know that you tried to enjoy and not just take photos. Sometimes it's necessary! "... hoping I could see the world with both my eyes..."
Oh wow, how very close the ropeway to those houses is! I would not want to live there. This is just so very Swiss! These lifts are fascinating and provide great views and access, but I find them a little unsettling to travel in Ayush. I would be scared to travel in the hanging car. This old goat likes two feet on the ground. Sometimes you just have to take it in,Ayush...Keep it in the memory card in your head. Wonderful view looking down Ayush, sadly I am too much of a coward to have been in one of these things when I have over in that part of the world. That would be fun. Sometimes photographers do miss just the viewing experience. Sometimes I leave my camera at home. I love these Swiss mountoin chalets. What a view! What a view, though. A nice view of the balconies, too, from the passing cable car. Sometimes "just viewing" is the best thing our cameras do, Ayush!